Secure parking at Leeds / Bradford Airport from Leeds Airport Parking. The UK airport car parking specialists. Get a quote now using the box to your right, and see how much you can save. Car park is located less than 5 minutes from Leeds / Bradford Airport. Bookings are accepted by telephone with postal confirmations. 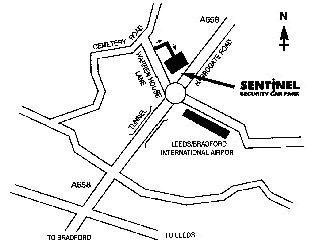 Leeds/Bradford airport is about 11 miles north west of the city centre off the A658. The airport is well sign posted from the M62 and A1, thereafter the airport can only be approached by poor quality A roads which add to the journey time. 2.3 million passengers passed through the terminal up to April last year, which was an increase of 17% over the previous year. Parking at our Leeds /Bradford car park is very limited in high season due to the ever-increasing popularity of this airport. Space is often at a premium and the price increases as space diminishes and customers are recommended to book as soon as their travel arrangements are known. Please remember once the space has been booked you are able to amend any time changes. The car park is only 5 minutes from the airport conveniently located off the A658 off the roundabout with the airport to your left. 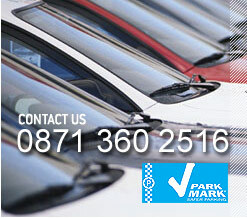 Security Measures: The car park holds the Safer Parking Park Mark accreditation for security. Important Information: We strongly recommend that you arrive at the car park at least 45 minutes before your check in time. Instructions for your return from the airport will be given upon your arrival. Why not start your holiday in style by booking hotel accommodation close to Leeds/ Bradford airport? This can be especially useful if you have to travel a long way and reduces the chances of missing your flight if you are caught up in traffic jams or even worse if your car breaks down. To book your Leeds/ Bradford hotel airport parking, first get a quote, and then follow the buttons. Why not take the opportunity to visit Leeds / Bradford and the Yorkshire as part of your holiday. Please see below Leeds / Bradford links, which may be of interest.